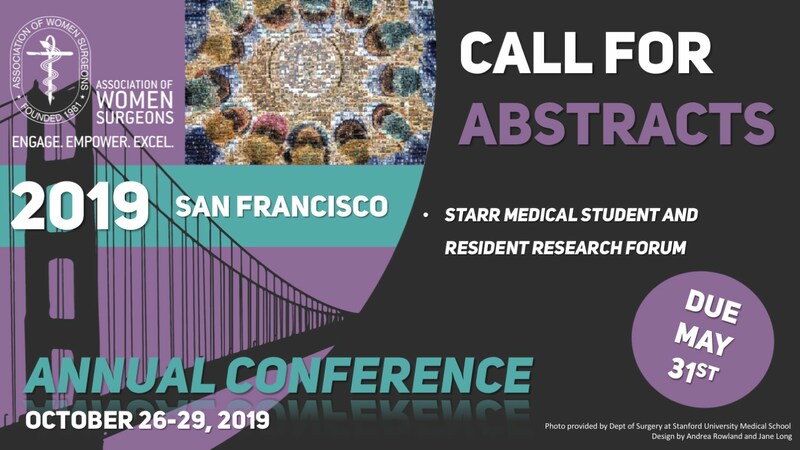 Student, resident and fellow members of AWS may submit up to two abstracts for the AWS Starr Medical Student and Resident Research Forum at the 2019 AWS Annual Conference. Abstracts are limited to 2250 characters and must have an Introduction, Methods, Results, Conclusions, and supporting author information. Incomplete abstracts will not be considered. Case reports and literature reviews will not be accepted. The deadline is 11:59PM EST on May 31. All abstracts are being considered for a Quickshot presentation at the AWS Annual Conference in San Francisco. More details will be provided at a later date. Recognition and a monetary prize will be awarded for the top three medical student presentations and top three resident/fellow presentations ($250 for 1st, $150 for 2nd, and $100 for 3rd). The top student and resident/fellow presentation winners will also receive a complimentary ticket to the AWS Foundation Awards Dinner on Monday, October 28.